You are currently browsing the tag archive for the ‘Brian Shivers’ tag. A TERMINALLY ill man jailed for the killing of two soldiers at a military base in Antrim was wrongly convicted of murder, the Court of Appeal in Belfast heard yesterday. Lawyers for Brian Shivers claimed it was legally impossible for him to have been found guilty on the facts as a secondary party. Shivers is seeking to overturn a verdict that he played a role in the murder of Sappers Mark Quinsey (23) and Patrick Azimkar (21). The victims were gunned down by the Real IRA as they collected pizza at the gates of Massereene Barracks in March 2009. The shootings were carried out hours before the soldiers were due to be deployed to Afghanistan. Earlier this year Shivers (46), from Magherafelt, Co Derry, was ordered to serve a minimum 25 years in prison for his part in the killings. He was also found guilty of six counts of attempted murder and one of possession of two firearms with intent to endanger life. His co-accused, Colin Duffy, a 44-year-old republican from Lurgan, Co Armagh, was acquitted of all charges, including the two murders. It emerged during the trial that Shivers suffers from cystic fibrosis and has only a few years to live. He was found guilty on the strength of a DNA link to matches found in the partially burned-out getaway car used in the gun attack. Shivers was also found to have lied about his whereabouts and actions on the night of the murders. The judge who convicted him accepted he played a lesser role than the gunmen, but drew attention to his alleged attempt to destroy the Vauxhall Cavalier. Yesterday Patrick O’Connor QC, for Shivers, said the guilty verdict was unsafe. He argued there was no actus reus – criminal act – prior to the murders which is legally required in law. “The findings of fact by the learned trial judge provide no basis at all for these convictions,” Mr O’Connor contended. Heavily bearded and dressed in a short-sleeved shirt, Shivers was brought into court in handcuffs for the appeal hearing. His barrister acknowledged the terrible consequences of the shootings. “These were appalling offences which caused immense loss and suffering to the victims and families,” Mr O’Connor said. “Nothing we say can, nor is intended to, detract from that.” However he insisted that to convict his client of the murders as a secondary party the trial judge had to find proven an act of complicity in the crime. Terence Mooney QC, for the Crown, rejected the case. He told the court the gunmen could only be confident enough to carry out the attack if they knew beforehand that the car was going to be destroyed at a rendezvous point. “Having said ‘Yes, I will be there’, that is an act, although it is a spoken act, it is an act as much as any other in the sequence that allowed the gunmen to escape,” Mr Mooney said. Lord Chief Justice Sir Declan Morgan, sitting with Lord Justices Higgins and Girvan, reserved judgment in the appeal. A TERMINALLY ill dissident republican jailed for murdering two soldiers in Antrim has launched a legal bid to overturn his conviction. Brian Shivers, 46, lodged papers to appeal the verdict that he was guilty of killing Sappers Mark Quinsey, 23, and Patrick Azimkar, 21. His legal team claim he was wrongly punished and want an urgent hearing due to his cystic fibrosis. The soldiers were shot by the Real IRA as they collected pizzas outside the Massereene barracks in Antrim in March 2009, hours before they deployed to Afghanistan. Shivers, from Magherafelt, Co Derry, was ordered to serve a minimum of 25 years in prison after being convicted of the killings last month. He was also found guilty of six counts of attempted murder and one of possession of two firearms and ammunition with intent to endanger life. His co-accused, veteran republican Colin Duffy, was acquitted of all charges. A terminally ill man convicted of murdering two soldiers at Massereene Barracks, Antrim, has been told he must serve a minimum of 25 years in jail. Brian Shivers, 46, from Magherafelt was convicted last month of the murders of Mark Quinsey, 23, and Patrick Azimkar, 21. They were shot dead by the Real IRA as they collected pizza in March 2009. The court heard that Shivers has cystic fibrosis and doctors believe he has only a few years to live. At Belfast Crown Court on Friday, Mr Justice Anthony Hart told him he would have to spend at least 25 years in prison before he could be considered for release. Sapper Quinsey, from Birmingham, and Sapper Azimkar, from London, both serving with 38 Engineer Regiment, were about to leave for a tour of Afghanistan in March 2009 when they were murdered by republican dissidents opposed to the Good Friday peace deal. The soldiers’ mothers were not in court on Friday, but the judge referred to statements in which they said their lives had been devastated by their loss. Mark Quinsey’s mother, Pamela, said: “A mother thinks she will hold her child’s hand for the rest of her life. Now my hand is empty and lost. I get no rest from the hurt and torment it has caused us all. Patrick Azimkar’s mother, Geraldine, said: “We have all changed, all aged, our hearts and souls are no longer light but weighed down with sorrow and loss. Sentencing Shivers, Judge Hart said: “Whilst he played a lesser role than the gunmen and driver of the attack car, by setting fire to the car he played a prominent and essential role in this carefully planned and ruthlessly executed crime. Addressing Shivers’ illness, the judge said: “The appropriate approach for the court to take is to proceed on the basis that such matters are irrelevant to sentencing, provided that the court is satisfied that there are available appropriate facilities within the prison to allow for such conditions to be properly dealt with. As Shivers turned to leave the court, members in the public gallery raised their thumbs at him. Shivers’ co-accused, Colin Duffy, 44, from Lurgan was earlier acquitted of murdering the two soldiers. Police have renewed their appeal for information about the murders. They have issued a recording of a phone call made by the killers shortly after the attack. The recording was on a mobile phone left in a green Vauxhall Cavalier car which the gang failed to set on fire at Ranaghan Road, about eight miles from Massereene. Anyone who thinks they recognise any of the voices on the recording is asked to contact police. THE limited life expectancy of a terminally-ill dissident republican convicted of murdering two British soldiers should not influence the length of his jail term, his defence lawyer has accepted. 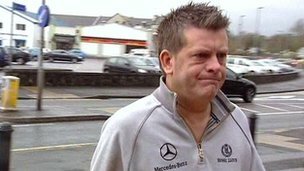 Cystic fibrosis sufferer Brian Shivers, 46, was handed a life sentence last month after being found guilty of the murders of Sappers Patrick Azimkar, 21, and Mark Quinsey, 23, outside Massereene Army barracks in Antrim on March 7, 2009. His lawyer, Pat O’Connor QC, told Belfast Crown Court his client had only four or five years to live. But he acknowledged judge Justice Anthony Hart was duty bound to impose a minimum term that was much longer. “There’s no allowance that my lord can make that can have any meaning in relation to a life expectancy that is so limited,” he said. Justice Hart was hearing submissions before setting what tariff the killer will receive. He is due to give his decision next Friday. Shivers, dressed in a grey jumper and jeans and sporting a beard, sat impassively in the dock as his lawyer told the court he faced spending the last years of his life behind bars. “The life expectancy of Mr Shivers in the opinion of the most eminent expert in the field is four to five years,” said Mr O’Connor. The English soldiers from the 38 Engineer Regiment were about to begin a tour of duty in Afghanistan when they were gunned down in an attack by republicans opposed to the Good Friday Agreement. Sapper Quinsey, from Birmingham, and Sapper Azimkar, from London, were dressed in their desert fatigues and were within hours of leaving the base. They were collecting pizzas at the front gate when they came under fire. Two other soldiers and two pizza delivery drivers were injured in the gun attack. Shivers’ co-accused, high-profile republican Colin Duffy, 44, from Lurgan, was acquitted of the murder charges in the non-jury trial at Antrim Crown Court. Mr O’Connor said Shivers, from Magherafelt, had been reassured by a letter from the Prison Service, outlining what treatment would be offered for his condition while he is in custody. Prosecution lawyer Terence Mooney QC told the judge that a term at the higher end was appropriate, adding that there were many aggravating factors, including the fact that the murders were politically motivated acts of terrorism. Mr Mooney said the sappers’ relatives and the survivors of the attack had submitted very personal victim impact statements to the judge, but he did not think it appropriate to detail their contents in open court. Mr O’Connor said no-one could fail to be moved by the evidence. DNA on matchsticks found in the partially burned-out Vauxhall Cavalier getaway car used in the ambush and abandoned eight miles away proved Shivers’ undoing at his trial. Delivering his reserved judgment two weeks ago Justice Hart, who accused Shivers of inventing an alibi for his movements on the night of the attack, said he was satisfied that he had tried to set the car alight. Yesterday, the judge acknowledged that the prosecution case claimed Shivers was a secondary party to the murders. But he said that that would not have a significant influence on the length of term imposed. “I think any allowance would be modest,” said the judge. Relatives of Shivers and Duffy sat in the public gallery of Court 11 during the brief tariff hearing. BRIAN SHIVERS was yesterday convicted of the 2009 dissident republican murders of British soldiers Patrick Azimkar and Mark Quinsey in Antrim. His co-accused, leading Lurgan republican Colin Duffy, was found not guilty of involvement in the murders. Shivers (46) from Magherafelt, Co Derry, was sentenced to life in prison by Mr Justice Hart, while 44-year-old Mr Duffy walked free to be greeted by his family and supporters at Antrim Crown Court. Both men were charged with two counts of murder, six of attempted murder and one of possession of two firearms and ammunition with intent to endanger life. Mr Quinsey (23) and Mr Azimkar (21) died in a hail of gunfire on March 7th, 2009, at the Massereene British army barracks as they collected a pizza delivery at the gates of the base. The Real IRA claimed responsibility. During the trial, CCTV footage was shown of two gunmen firing from AK47 rifles at soldiers and delivery men at the gates. The court also heard an audio clip created when one of the gang accidentally recorded himself on a mobile phone in the getaway car. He said: “There was a few dead all right,” and “I have to say boys you were as cool as f**k”. The prosecution’s case was that Mr Duffy and Shivers either “assisted in the attack” or were involved in a joint enterprise knowing an attack would take place. It contended that DNA linking both men to the getaway car would establish the guilt of Mr Duffy and Shivers. The DNA evidence was recovered from the Vauxhall Cavalier getaway car, which the dissident gang failed in its attempt to burn. Mr Justice Hart accepted that DNA from the tip of a finger of a latex glove in the car and from the metal tongue of the front passenger seat belt was Mr Duffy’s. However, he found that Mr Duffy, who is 5ft 11in (180cm), could not have been one of the gunmen because expert evidence estimated their height at 6ft 3in (191cm) and 6ft 6in (198cm). Moreover, expert evidence found the voice that was recorded was not Mr Duffy’s and as there were just three people in the car, including the gunmen, Mr Duffy could not have been involved in the attack. The judge was satisfied that at some stage between the purchase of the car in February 2009 and the attack, Mr Duffy was in the vehicle while wearing latex gloves and that “he must have known that the Cavalier was going to be used by others in the commission and furtherance of a criminal act”. While there was strong suspicion Mr Duffy “did know what was going to happen”, this was not sufficient by itself to establish guilt. The judge found Shivers, who has cystic fibrosis, was involved in setting fire to the getaway car. He was satisfied Shivers’s DNA was found on two matches located in the car, and that these matches were used to light the vehicle. This was strengthened by traces of his DNA found on a mobile phone recovered from the car and on a match found outside the car. PRESIDING JUDGE Mr Justice Hart was one-hour and 45 minutes into his three-hour judgment when he informed high-profile republican Colin Duffy that he was not guilty and was free to go. Mr Duffy, with his long thick beard acquired while on dirty protest in Maghaberry prison, appeared to be shocked initially, but then his face briefly lit up with satisfaction before quickly returning to a more composed expression. There was a whoop, some gasps and some clapping from members of his family and supporters sitting on the far side of the court from the families of Patrick Azimkar and Mark Quinsey, the two British army sappers gunned to death in Antrim in March 2009. Mr Justice Hart, in his last case before his retirement, warned earlier that any such reaction would lead to him clearing those responsible out of the court, which he did in perfunctory manner. 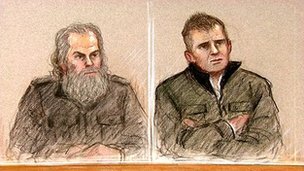 As Mr Duffy left the court the faces of the Azimkars and Quinseys were also a study in shock, but of an entirely contrasting kind, denoted by accompanying tears from some of the group. The judge then spent more than an hour outlining the case against Shivers – who sufferers from cystic fibrosis and has been told by a doctor he has only three or four years to live – in the end pronouncing him guilty and sentencing him to life in prison, the minimum term he must serve to be decided in about three weeks’ time. His lawyer, Pat O’Connor QC, was severely rebuked by the judge as he attempted to stop him passing sentence. Mr O’Connor later apologised and explained that because of Shivers’s illness he hoped he would defer sentence so it could be established that the sentenced man would get proper medical support in prison. “His life is at risk, there is no question, if he’s not given a proper regime,” he said. Mr Justice Hart informed him that there was never a chance that he could postpone imposing the mandatory life sentence for murder but that his medical report should be passed on to the prison. Mr Duffy’s supporters had to wait another 90 minutes inside the building as the official formalities of releasing him from remand were processed. When he walked into the foyer at about 2.45 pm there were more cheers and family hugs for Mr Duffy. There were no comments for the press from Mr Duffy, as he was bundled into a car that drove off at speed. Loyalists screamed “scum” and “rot in hell” at the departing vehicle. Rather incongruously one loyalist complained loudly about being “fined £300 for shoplifting”, while the likes of Mr Duffy could walk free. A few miles outside the town in the Dunsilly Hotel, the PSNI and Azimkar and Quinsey families made statements to the press. The senior investigating officer, Chief Supt Peter Farrar, pledged that the investigation to apprehend the “evil murderers” would continue. DISSIDENT republican Brian Shivers was convicted today of murdering two British soldiers outside an army base in Northern Ireland. His conviction came after co-defendent Colin Duffy, a high-profile republican, was cleared of the same charges. Shivers was found guilty at Antrim Crown Court of the killings of sappers Patrick Azimkar, (21), from London, and Mark Quinsey, (23), from Birmingham, who were ambushed by gunmen from the Real IRA at the gates of Massereene barracks in Antrim on March 7 2009. Judge Anthony Hart told the court that he was satisfied that Duffy’s DNA was found on a latex glove tip inside the car and on a seat buckle but he said the prosecution had failed to link the defendant to the murder plot. The non-jury trial lasted six weeks. It ended just before Christmas and Mr Justice Hart took four weeks to consider his verdicts. The soldiers from the 38 Engineer Regiment were about to begin a tour of duty in Afghanistan when they were gunned down in an attack by republican extremists opposed to the Good Friday peace deal of 1998. The victims, who were wearing their desert fatigues and were within hours of leaving the base, were collecting pizzas at the front gate when they came under fire. Four other people, including two pizza delivery drivers, were injured in the gun attack. A green Vauxhall Cavalier car thought to have been used by the gang was found abandoned in a rural location eight miles away. The gunmen set light to the car, but it did not burn out. DNA evidence recovered from it formed the basis for the trial of the two accused. It is the second time Duffy has been cleared of murder. The 44-year-old first hit the headlines 20 years ago after he was cleared of an IRA murder. An IRA gunman on a bicycle shot former soldier John Lyness, 57, in Lurgan in June 1993. Duffy, described in court as an unemployed labourer, was subsequently convicted of the murder. But the prosecution case hinged on the testimony of anonymous witnesses who gave evidence from behind a curtain – and in particular on the evidence of a man known only as Witness C.
He turned out to be Lindsay Robb, who was subsequently jailed after police in Scotland smashed a UVF gun-running plot in July 1995. Following a public campaign for his release, backed by nationalist political leaders here and in Northern Ireland, Duffy’s conviction was quashed because the prosecution could no longer rely on a star witness publicly revealed to be a loyalist paramilitary. Duffy walked from the Court of Appeal in Belfast a free man and later gave an impromptu press conference outside the gates of the High Court, alleging police wrongdoing and insisting he was innocent. Three years earlier, Duffy, then aged 22, was caught up in a loyalist gun attack that remains, to this day, shrouded in controversy. He and two other republicans were reporting to Lurgan’s Royal Ulster Constabulary (RUC) station to sign in as part of bail conditions on charges of possession of ammunition. The trio were followed by a red Maestro car, later revealed to be a military intelligence vehicle, before a second car also appeared on the scene. Two masked men armed with AK-47 assault rifles stepped out of the second vehicle and pursued the three republicans. Duffy escaped the murder bid launched by the loyalist Ulster Volunteer Force (UVF), but the alleged security force link saw Sinn Fein call for a full inquiry at the time. Brian Shivers has been found guilty of murdering two British soldiers outside a British army base in Northern Ireland, while earlier the judge found co-accused Colin Duffy not guilty. Brian Shivers has been found guilty at Antrim Crown Court of murdering two British soldiers outside a British army base in Northern Ireland. A second man, 44-year-old Colin Duffy was earlier found not guilty of the murders. Shivers, 46, who has cystic fibrosis, denied having any involvement in the Real IRA attack on the barracks in 2009. The evidence against Shivers centred on DNA which was discovered on a mobile phone and matches linked to the getaway car. During his trial his lawyers described him as an “unlikely terrorist”. He told the court he had a limited life span and had been told by a doctor that he only had a few years left to live. Handing down the judgement today, Mr Justice Anthony Hart said Shivers lied about his actions on the night of the attack. The judge said the presence of his DNA on the Nokia phone was further evidence of his involvement in the getaway car. Shivers was sentenced to life in prison. 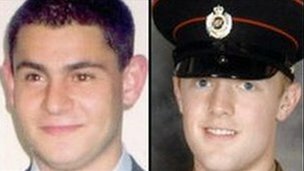 Sappers Patrick Azimkar from London and Mark Quinsey from Birmingham were killed outside the Massereene barracks on 7 March 2009. Four others, including two pizza delivery men, were seriously injured in the attack, for which the Real IRA claimed responsibility. Mr Duffy, from Forest Glade in Lurgan in Armagh, was cleared of all charges by Mr Justice Anthony Harte this morning. Judge Anthony Hart told the court that he was satisfied that Duffy’s DNA was found on a latex glove tip inside the car – and on a seat buckle – but he said the prosecution had failed to link the defendant to the murder plot. He said “all the evidence” suggested Mr Duffy was present in the getaway car wearing latex gloves at some point between the time it was bought and the time it was used in the attack. But the judge said that suspicion that the car was going to be used in a criminal act was not enough to convict Mr Duffy. The judge described the attack in “ruthless and determined”. He said one of the gunmen had reloaded his weapon at the scene and that a number of the victims were shot as they lay injured on the ground. Following Mr Duffy’s acquittal, Mr Justice Hart cleared the court of a number of cheering supporters. Two men accused of the murders of two soldiers at a Northern Ireland military base are due to find out the court’s verdict. Sappers Patrick Azimkar, 21, from London, and Mark Quinsey, 23, from Birmingham, were ambushed by gunmen from the dissident republican Real IRA outside the Massereene barracks in Antrim on March 7, 2009. Mr Justice Anthony Hart, sitting at Antrim courthouse, will tell Colin Duffy, 44, and Brian Shivers, 46, if he has found them guilty or not guilty of the murders. Duffy, from Forest Glade in Lurgan, Co Armagh, and Shivers, from Sperrin Mews in Magherafelt, Co Derry, deny the murder charges and six further counts of attempted murder. The troops from 38 Engineer Regiment were about to begin a tour of duty in Afghanistan when they were gunned down in an attack by the Real IRA group, which opposes the Good Friday peace deal of 1998. The soldiers, who were wearing their desert fatigues and were within hours of leaving the base, were collecting pizzas at the front gate when they came under fire. Republican dissidents are in “uproar” over an attempt by a murder suspect to link the son of Dominic ‘Mad Dog’ McGlinchey to the killing of two British soldiers, the Herald has learned. Supporters of Dominic McGlinchey Junior are furious over the bid to blame him for driving the getaway car in the murder of two British soldiers in the north two years ago. They have also claimed that McGlinchey Junior rejected a plea from supporters of republican prisoner Colin Duffy to agree that his name be read out in court as the Police Service of Northern Ireland’s suspect in the case. Duffy is one of two men charged with murdering British army sappers Patrick Azimkar and Mark Quinsey outside Massereene barracks in 2008. A supporter of McGlinchey Junior said the court claim has caused “uproar, outrage and anger” within republicanism. McGlinchey’s father was one of the most notorious terrorists of the Troubles and in the mid-1980s became Ireland’s most wanted man. The self-confessed INLA murderer led the terror group during its bloodiest period. The original ‘Mad Dog’ died in a hail of bullets in Drogheda 18 years ago. He was gunned down in a revenge attack by a South Armagh family who blamed him for murdering their brother-in-law during the 1980s. That killing was witnessed by Dominic Junior who watched his father being shot dead while he tried to make a call from a Drogheda phone booth. McGlinchey Junior has denied the allegations made in court and said that since they were made public he has lost his job in Co Derry. One of his supporters told the Herald: “Before the trial, a message was sent out of Maghaberry jail that Colin Duffy wanted to know if it was okay to state in court that the police had Dominic Junior as their main suspect. He said there was anger towards Duffy over the attempt to bring McGlinchey Junior into the frame. Duffy is currently on 24-hour lock-up inside Maghaberry prison in the north and is on a no-wash protest against his incarceration in the jail. The Lurgan republican, along with Brian Shivers, denies involvement in the Real IRA double murder. One of the men accused of murdering two soldiers at Massereene barracks in March 2009 has been in the witness box. Brian Shivers told Belfast Crown Court that just months before the attack he had been told he only had a few years left to live. He is charged along with Colin Duffy of killing Sappers Patrick Azimkar and Mark Quinsey at the barracks in Antrim in March 2009. Mr Shivers told the court he had nothing whatsoever to do with the crime. He said he had been to about three or four meetings of the republican political group Eirigi but had never joined the group, nor had he been inspired by it and he had no desire to be involved in anything political. Mr Shivers also said he had never even met Mr Duffy prior to his arrest. He also told the court he suffered from cystic fibrosis from an early age and in the November before the attacks on Massereene barracks, he had gone to the hospital with his fiancée to be told he had only five or six years left to live. He said that was hard hitting and said he had other things in life to do rather than getting involved in anything like that. Mr Shivers also outlined his movements on the day of the killings. He is expected to return to the stand on Monday afternoon. Earlier on Monday, the court heard from a DNA expert for the defence. Prof Dan Krane said the DNA in the case against Mr Duffy was in small amounts, did not necessarily mean he had been in direct contact with the getaway car and could have got there through secondary transfer. Prof Krane said: “What it establishes is that his DNA may be associated with the glove and it may be associated with the belt buckle of the car. “The presence of a DNA profile per se does not say anything about the timeframe or the circumstances under which the DNA came to be there. “The DNA tests themselves cannot answer that type of question. Prof Krane told Belfast Crown Court sitting in Antrim that the sample relating to Mr Duffy came from a mixture of DNA from two or more people, meaning there was a possibility that somebody other than Mr Duffy came into contact with the glove. He said Dr Mark Perlin, a prosecution witness who used an innovative DNA analysis method to link the accused to the getaway car, did not have a proper understanding of certain effects associated with the research. Prosecution barrister Terence Mooney QC said the witness had opposed efforts to advance the use of DNA analysis. “As soon as you lose the battle on an issue you move to another one and create more confusion,” he said. As well as the murder charges, Mr Duffy, 44, from Lurgan and Magherafelt man Mr Shivers, 46, both deny six charges of attempted murder and one of possession of guns and explosives. The partner of one of the men accused of murdering two soldiers at Massereene barracks in 2009 has been testifying. Colin Duffy and Brian Shivers deny murdering Sappers Patrick Azimkar and Mark Quinsey in 2009. Mr Shivers’ girlfriend told the court that when the couple learned of the attack the day after the shootings they were “disgusted and appalled”. She said she believed Mr Shivers had been at a work leaving do in Belfast on the night of the shooting, and had arrived home early. Ms Leacock said she had not noticed anything abnormal or suspicious about his behaviour. She said she couldn’t be 100% sure of the time of his arrival home, but she believed it to be between 21:55 GMT and 22:10 GMT. However, a prosecution barrister questioned her about why she had not told the police that. Ms Leacock said she extended the time to 22:20 GMT after police read a statement to her. Ms Leacock, a Protestant, who has been dating the accused for around six years, said she and a cousin had received bullets in the post after Mr Shivers’ arrest. The two soldiers were shot dead as they collected pizzas outside the base in Antrim in March 2009, the night before they were due to leave for Afghanistan. A man accused of the murder of two soldiers made a flurry of phone calls around the time of the killing, a court heard today. Colin Duffy and Brian Shivers deny the murder of Sappers Mark Quinsey and Patrick Azimkar, who were shot outside their army base in Antrim. Shivers’ phone was recovered by police. Sappers Quinsey (aged 23), and Azimkar (aged 21), were shot dead by the Real IRA as they collected pizzas with comrades outside Massereene Army base in Antrim town in March 2009. Duffy, 44, from Forest Glade in Lurgan, Co Armagh, and Shivers, 46, from Sperrin Mews, in Magherafelt, Co Derry, deny two charges of murder and the attempted murder of six others – three soldiers, two pizza delivery drivers and a security guard. Messages from another mobile phone suspected to have been used by the killers were also disclosed to the court. A voicemail was played to the court which appeared to link the car to the shooting as the men made their escape. The phone recorded two voices talking following the killing, close to where the vehicle was abandoned and later recovered by police, yielding DNA evidence which the prosecution say links the accused to the crime. The trial of two men accused of killing two soldiers at Massereene barracks in 2009 has been hearing police statements about their arrests. Colin Duffy and Brian Shivers deny murdering Sappers Patrick Azimkar, 21, from London and Mark Quinsey, 23, from Birmingham, at the Army base. Mr Duffy was arrested at his home in Lurgan seven days after the murders. His house was searched and a number of items seized. The court was told that when charges of murder and attempted murder were put to him he replied “definitely not guilty”. Mr Shivers was arrested at his Magherafelt home on 21 July 2009, four months after the murders. The court was also told the trial could continue into January because a forensic witness who examined and linked soil samples from boots seized from Mr Duffy’s house is ill.